I bought a lower a couple of years ago to build into a pistol, and now those PSA complete pistol kits are looking pretty tempting. I've watched a few videos, and I'm pretty sure I could assemble the lower, but I'm wondering what the minimum necssary tools are to do the job? Also, for those of you who have built lowers before, do you stake the castle nut? Do you just use a punch? The main thing is getting the bolt catch roll pin installed and you'll need a set of good punches. This is all I used to assemble my first lower. I've bought some tools along the way since then. I just snugged the nut down with a punch and hammer. Channel lock and a pocket screwdriver. Might be a bit more minimal than you meant though. I live just up the road from you - would always be happy to lend you my punch set and AR wrench if you want to try before you buy your own, so to speak. I don't have much but, like you said, the minimum necessary - simple things, but I've assembled a few lowers in my days. I've never staked a castle nut, though. Of course. I just picked up the two-punch AR set - the ones with the half-circle shaped handles so the flat side can go against the lower - and the Magpul AR wrench from Cabela's. That's really all I use for assembling lowers. That and a small hammer to hit the punch with. Note the taped Channel Locks in Powermad pic. Push roll pins in with Channel Locks. Punches help to align the holes. Geiselle makes a nice Armour's kit which goes on sale every Black Friday. The Geiselle Trigger punch is useful-especially with a "guide" trigger pin. These are a little expensive, but worth the money for installing the bolt catch and trigger guard pins. Yes, they can be done with a roll pin punch and hammer, but the Kinpex pliers make life so much easier. You'll also need a razor blade to compress and hold the front takedown spring and pin down in the hole while you slide the takedown pin into position. The rubber end of an unsharpened pencil makes pushing the mag catch into the receiver far enough to tighten the catch up. As far as staking the castle nut. It's pretty easy. I just use a center punch, either my spring loaded one or just a hammer and the steel center punch. Give it a couple of good taps and it moves just enough metal. Of the 8 or so I've built, I think I've only ever staked maybe 2 or 3. And that was just to see how it went. Never had a problem with a castle nut coming loose. I'm pretty sure lkdr1898 was meaning to write vise and not vice, but then again maybe not. Brownell's is a great place to get the tools and the instruction videos. Thank you for the links - very helpful. A large Ziplock bag to assemble the lower in. Helps to contain any parts that want to leap out during installation. Get the magpul wrench. Its worth the money. Put some electrical tape on the lower when you tap in the roll pin for the bolt catch. It will prevent the lower from getting scratched. Be careful when you install the trigger guard. The little ears that the roll pin goes in are known to break. A one gallon ziplock bag. You will thank me. Opps, sorry shovelhead, I scanned the replies a little to quickly. I'd suggest as a minimum a good set of punches, a gunsmith hammer and a castle nut wrench. I use my punch set, gunsmith hammer anytime I work on any gun. 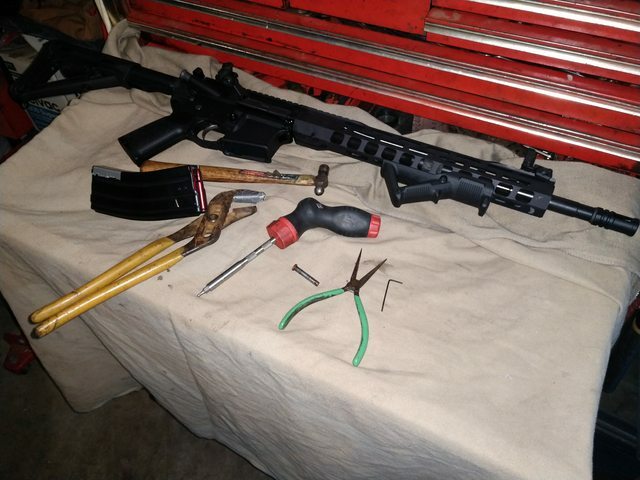 Extra credit for the Magpul wrench and an upper/lower vice block set. I also use a set of screw driver and allen tips made for gunsmithing all the time. I stake my castle nuts 'cause it's easy and why not? I just use a pointed center punch and whack it a bunch with my gunsmith hammer which is a bit light for the job, but it won't over-do it! I've assembled a bunch of lowers, but each time I do, I don;t rely on memory. I pull up a youtube video to make 100% sure I'm doing certain steps right. For me the minimum tools necessary is something to do the grip screw. That's pretty hard to overcome. Normally its a screwdriver, but it may be an allen wrench. I've done it with nothing but a screwdriver. After that everything else can be improvised. Me I'm happy with 1. a punch 2. a small hammer 3. something 1/4"od with a hole for the takedown pin (*I make these, but a clevis pin works). If you are going to buy a castle nut wrench; please look at the Hammerhead brand wrench. It's the best I've seen/used! If you're sure you'll never ever,ever do but one lower --- then by all means go the slow tedious "improvised tool" route. Acquire the "proper" tools and make lower receiver assembly a swift, sure, frustration free process! You will reduce the danger of scratching/scarring your receiver too. Yes, assembly can be made with absolutely no special tools and a great deal of patience and improvisation/ingenuity! Best of luck,whichever way you go. Forward Controls castle nut wrench is my go-to. Its a 2- and 3-prong wrench to fit bare castle nuts or those partially blocked by a larger end plate/QD setup. It's a smaller tool to be used with a breaker bar or torque wrench. I have one of the generic AR combo wrenches that I used for several years before getting the one from Forward Controls, it's garbage in comparison. VERY important if you don't want your first project to look like your first project. Don't be shy; protect everything from the bolt catch projection to the rear where the buffer tube screws in. Staking can be accomplished by any hardened steel tool with an appropriately sized tip. A punch will do fine, but if you want it to look like a factory job, by all means buy a staking tool.